I recently read Chris Brenner’s recent post on interpreting the Saturn Return. It’s quite well done and very informative. Chris has a slightly different take on the duration of the return. To quote him directly: “The Saturn return begins as soon as Saturn moves back into the same sign that it was in when you were born, and it ends when Saturn leaves that sign.” Being grounded in Hellenistic astrology, Chris recommends using whole sign houses in which the first house is the entire sign that contains the Ascendant and the subsequent houses are the following zodiacal signs in order around the wheel. My own practice has been to use the Midheaven as the cusp of the 10th house and I have little practical experience using whole sign houses to determine the 10th house. In the whole sign system the MC can fall, for example, in other Placidus or Regiomontanus houses other than the 10th. The MC is then treated as a highly sensitive point whose house position can vary. I left a comment on Chris’ site about a phenomenon I had noticed when I was first learning astrology back in the late 50s and early 60s but could not find in any of the books I was using. Following the transits to my own chart over time (with Placidus houses), I noticed that whenever a planet changed signs, an event was likely to occur that corresponded symbolically to the Placidus house whose cusp had that sign. This occurred even though the planet was in the previous Placidus house. To check if this was still happening, I tracked the Moon in my chart for the past few days. On March 11th I had an appointment with my accountant to prepare income taxes. The Moon entered Scorpio in my first house that day. My Placidus 2nd house cusp (money) lies in 9 Scorpio, so it made sense I would be dealing with finances when the Moon entered the sign on my 2nd Placidus cusp. The Moon entered Sagittarius in my 2nd house on March 13th, but 10 Sagittarius lies on the cusp of my Placidus 3rd house, so I was expecting an event related to mail, messages, siblings, short trips, etc. A few weeks ago I had ordered a book from abroad, which had not arrived yet. Based on my experience with this phenomenon, I thought it was likely that the book would arrive on March 13th when the Moon entered the sign on my 3rd Placidus cusp. Sure enough, when the mail arrived, the book was included. In light of Chris’ post, it may be that what I have been observing all these years is the phenomenon of whole sign houses. The issue of whole sign house came up when I was translating Morin’s Book 18. In discussing the chart of King Gustave Adolphe of Sweden, Morin notes that he has Saturn in his Regiomontanus 8th house but that Saturn lies in his 9th house “accidentally.” I double checked Morin’s original Latin to be sure I was understanding him correctly because he didn’t explain what he meant by “accidental” houses. Puzzled by this, I asked Morin expert James Holden for his opinion. James said that Morin might have been referring to whole sign houses. After my translation was published, Martin Gansten wrote to me, saying that Morin never used whole sign houses. Martin is a very scholarly astrologer, so I am left puzzled by Morin’s comment. I’m still not sure what to make of Morin’s use of “accidental” houses to account for Saturn being in the Regiomontanus 8th but in the accidental 9th, which happens to be the 9th whole sign house. In any case, Chris Brenner’s post got me thinking about whole sign houses and reviewing my own experiences in which the whole sign approach seemed to give good results. The problem for me with using more than one house system consistently is that it becomes impossible to predict except retrospectively. Predicting things that have already happened is educational, but I get better results looking forward keeping things very simple and assuming that the different systems work for people because they are using them consistently too. Very interesting post. I’ve never worked with whole sign houses before. You’ve inspired me to track my moon, as well. The “accidental 9th house” is indeed puzzling. One more option, besides checking the whole sign houses and equal houses would be to look at the houses from the Lot of Fortune – but it’s not the case here – Fortune is not 9 houses away in any way (neither with Morin’s nor true planetary positions). The other option that I can think of now is to see what house in HIS house system would happen to be the 5th house from where the Saturn is (8th house counting backwards). And this would be the 12th house. 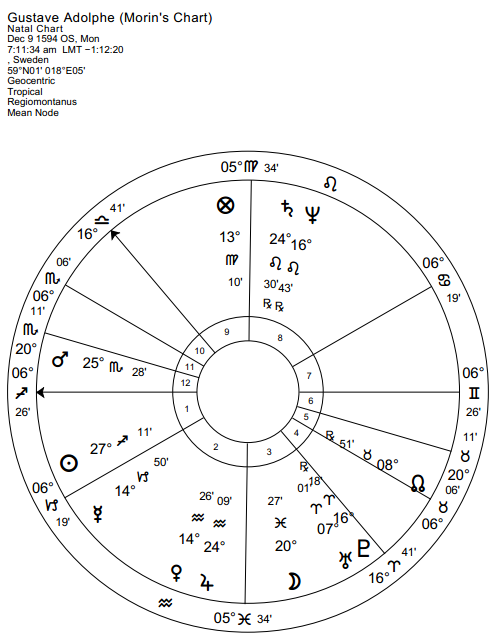 No connection to Mars or Scorpio by rulership, but 12th house is the house of Joy for Saturn. I don’t claim it to be the answer here, but could the “accidental” sign be how far away is it from the place of rejoice? It is indeed based on accidental dignities of Saturn (houses of diurnal motion, not zodiacal), so at least it is worth taking into account, I think.